The Daniel Fast is a powerful method for spiritual prayer and fasting. And the Daniel Fast instructions are simple once you learn the boundaries. The Daniel Fast eating plan is like a vegan diet with more restrictions. The only beverage is water. So the primary foods are fruits, vegetables, whole grains and legumes. There are no sweeteners on the fast — and no processed foods or chemicals. Clearly, the purpose of the fast is to draw closer to God. During your fast you will want to focus your time with God for a specific purpose or to gain His advice, intervention or direction in your life. Again, check out our website where we are able to be more specific about the Daniel Fast instructions. Yes, all healthy oils are allowed on the Daniel Fast. First, no, that Daniel Fast doesn’t call for a water only fast to begin the experience. I suggest you spend the next 3-5 days weaning yourself off caffeine even though you’ve already started the fast. Make it part of your spiritual experience and be vigilant about getting rid of the caffeine. My husband and I are both beginning the fast tomorrow. We both drink coffee and did not cut back gradually, so I am concerned about getting a serious headache. It happened to me once before when I stopped caffeine. Also, are we supposed to fast with only water for the first 3 days? I heard this somewhere. Yes, Unsweetened additive free peanut butter is allowed on the fast. The Ingredients list should be very simple: Peanuts and maybe some salt. One peanut butter we can recommend for the fast is Adam’s 100% Natural Peanut Butter. One of the two foundational scriptures for the fast are: Daniel 1:12 “Prove thy servants, I beseech thee, ten days; and let them give us pulse to eat, and “water” to drink.” This is why we drink water only and although plant based, there is no coffee or tea on the fast. I hope this helps, Be Blessed on your fast! What about natural peanut butter and gluten free rice cakes? Also, why is tea not allowed if left unsweetened? That would be considered natural/plant based, no? Thank you. I am trusting God to renew my mind so that I can develop a deep and intimate relationship with him. Please pray with me. Yes, Citric acid is used as natural preservative in a lot of canned foods. It is considered natural because it is derived from plants, so it’s allowed on the Daniel Fast. Be Blessed on your fast! Is tomato sauce with citric acid okay? The best thing is to get a copy of the Daniel Fast book so you can learn about the fast and adequately prepare yourself. Leavening, including yeast, is not allowed on the Daniel Fast, also there are not sweeteners on the Daniel Fast. Because of this typical Ezekiel bread is not allowed, however the Ezekiel Whole Grain Tortillas are. Be Blessed! Is Ezekiel bread allowed on the fast? The Daniel Fast is totally plant based, so no yogurt or eggs on the fast. Salad Dressing: A favorite prepared salad dressing is Newman’s Own Oil and Vinegar Salad Dressing, all the ingredients are acceptable for the Daniel Fast. Also, you can make your own dressings easily and quickly. There are many recipes in the Daniel Fast Cookbooks at http://daniel-fast.com/store.html Be blessed! Hi! I will begin my fast on tomorrow Lord spare my life, I wanted to know will I be able to eat yoplait yogurt while on the fast? A list of what types of salad dressing I could use on my salads, and are boiled eggs allowed? thanks for the advice in andvance..
Sourdough bread is not allowed on the Daniel Fast, due to the leavening (of which yeast only one type) and sourdough is another type of leaven. There really isn’t any type of raised bread for the Daniel Fast. There is flat bread like chapati, which is made from whole wheat flour, water and oil. Be blessed! can i eat sourdough bread for the Daniel’s fast? We have not initiated emails. Somehow you were subscribed to this blog and only you can unsubscribe. Please read this post to see how to stop the email notifications. You can either take them back to the grocery store (and yes, they do take returns) or, you can put them in the freezer for after your fast. I hope this helps! Yes, you can have pecans. But be sure to check if they are not raw since some companies add sweeteners or man-made chemicals. Raw is best, roasted in oil is second best. Yes, gram flour is a whole food and acceptable for the Daniel Fast. I assume you are making chapatti and not a pancake that would have leavening in it. The chapatti would have the gram flour, salt, oil and water, right? Yikes! I’m getting hungry! The good news is that there are many recipes that you can enjoy on the Daniel Fast. Many Mexican recipes do comply or with slight adjustments. Can i use gram flour to cook pancakes(indian recipe). Its basically just ground chick peas. Please let me know if this conforms to the daniel fast norms. Thank you very much for all your help and for hosting this very useful blog. Stay blessed. It seems that you are sharing your experience and as long as your heart is in the right place and humble, then all is well. That’s just one of the amazing life lessons we can learn from fasting. No leavened breads are allowed on the Daniel Fast, so you can Ezekiel whole grain tortillas, but no raised breads. Yes, onion rings and french fries are allowed, but you need to read the list of ingredients included to make sure they all comply with the Daniel Fast. Many vegan products are allowed. But you still need to watch the ingredients for sweeteners and chemicals. I started these fast today and so far, it’s a struggle. I’m Mexican, and right now, we’re making tamales. I can’t eat them and its definitely tempting. I know I can get through this and make my relationship closer to God. what about eating all vegan products — is it okay? I hope that I don’t seem like a hypocrite to people. I was not trying to boast. I posted that I am starting the fast today. Mostly to give myself accountability by sharing with others. This is the first time I am ever doing something like this. I am trying to learn to be a Christian. I grew up in church but was skeptical. As an adult now, I want to know, to learn. I’m not sure about Biotin, you can read the ingredients. Vitamins are fine. You will want to keep your fast “private” and not boast about it to bring attention to yourself. That’s what Jesus was coming against int he passage you noted. However, it’s okay to inform people if it’s for information. Actually in this case, it would be the loving thing to do so they will understand why you will only eat certain foods. Be blessed and I pray your life will be a witness to those you meet during your travels. Hey, wasn’t sure but….is it ok to take One A Day vitamins and Biotin supplements while fasting? I will be going out of town during my fast and I will be seeing other family members and most likely be going out to eat. I am sure questions will come up as to why I am not eating like usual. Can I let them know I am on a fast? I discovered this fast while researching one of my customer’s online, and immediately felt compelled to start ASAP. I need to cleanse both my spirit to prepare me for the next steps God has for me, and my body as I have had a lot of health issues lately, and the stresses in my life have caused some weight gain. I am looking forward to beginning this coming Monday, Oct 22nd. I must say that I love food, so I’m a little scared, but I will move forward with the resolve that I get only from God. Bless you Susan for your commitment. Hummus is great. Homemade hummus is best and very easy to make, not to mention also a lot fresher, you can adjust the flavors to your liking, and it’s way less expensive. Because of the benefits of hummus on the Daniel Fast, we included several recipes for it in my book, which is available at all online and local bookstores. 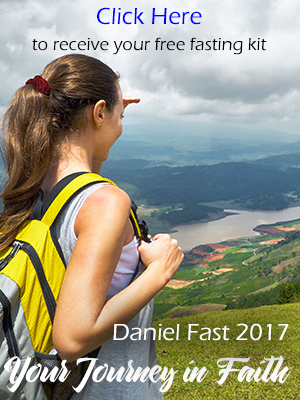 http://www.amazon.com/Daniel-Fast-Strengthen-Spirit-Renew/dp/1414334133 I hope this helps! Thank you so much!!! What about hummus?? ?